Looking for a gluten free meal the whole family will enjoy? 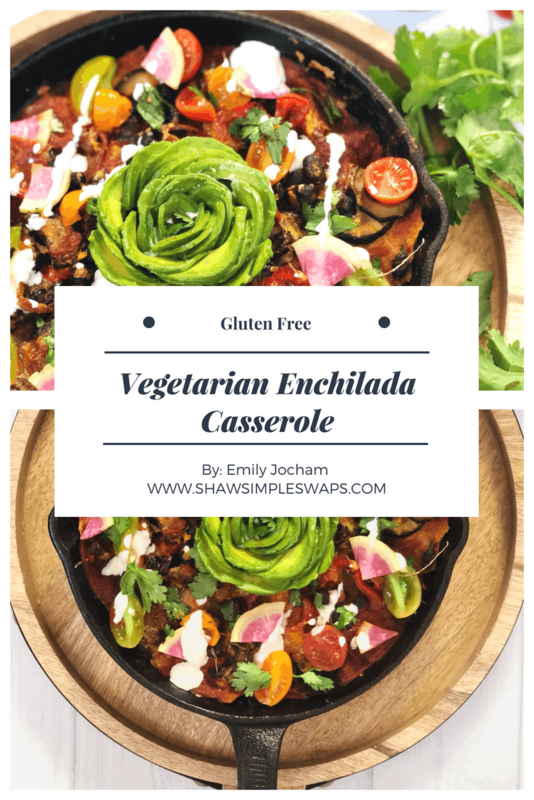 Then this Vegetarian Enchilada Casserole is for you! Literally, so glad my energy to cook has come back! And, just in time thankfully to whip up this delicious Vegetarian Enchilada Casserole from the fabulous intern Emily! I had the pleasure of meeting Emily Jocham briefly as she shadowed a day in the life of this extremely pregnant entrepreneur RDN! And, I’m happy to report Emily has since finished her RDN exam and is now a registered dietitian nutritionist! She primarily focuses on helping individuals develop and foster a healthy relationship with food and fitness. You can find more recipes and inspiration from her on Instagram @Lettuce_eat_right. 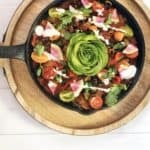 Enter, the Not Your Mama’s Vegetarian Enchilada Casserole! My mom is a TERRIBLE cook. But, if we were lucky, she would make the one recipe that my grandmother passed down to her: Vegetarian Enchilada Casserole. That’s where today’s recipe comes in. It is my mom’s one and only specialty, with some simple swaps to increase the nutrient content and decrease the calories. I love this take on enchiladas because it makes for great meal prep and almost all the ingredients can be substituted for whatever is already in your kitchen. For example, the vegetables used in the recipe can be substituted for whatever you have on hand, I often swap in sweet potatoes, broccoli, canned corn, or fresh spinach. The corn tortillas can also be substituted for flour, almond flour, or rice flour tortillas. See, the opportunities are endless… No wonder even my mom could pull this off! A delicious blend of hearty vegetables and tasty flavors! Preheat oven to 375 degrees Fahrenheit. Heat a large skillet to medium heat and add in oil and onion. Saute for 3-4 minutes until the onions begin to turn translucent. Add the rest of the vegetables and salt and pepper to taste. Cook for another 5-8 minutes or until everything is softened. Once the vegetables have reached your desired texture, add the taco seasoning and black beans and cook for another 1-2 minutes. Meanwhile, cover the bottom of a baking dish or cast iron skillet with a layer of enchilada sauce. Top with a layer of the corn tortillas tearing and placing pieces to fit until the entire surface is covered. Cover the tortillas with another thin layer of sauce. Add ½ the vegetable bean mixture and spread out over the tortillas. Top with ½ of the cheese. Repeat the tortilla, sauce, and vegetable layering process 1-2 more times depending on the size of your baking dish. Place the layered casserole in the pre-heated oven and cook for 20 minutes. Remove from the oven and let cool for 5-10 minutes. Garnish with avocado, salsa, cilantro, and greek yogurt to your liking! 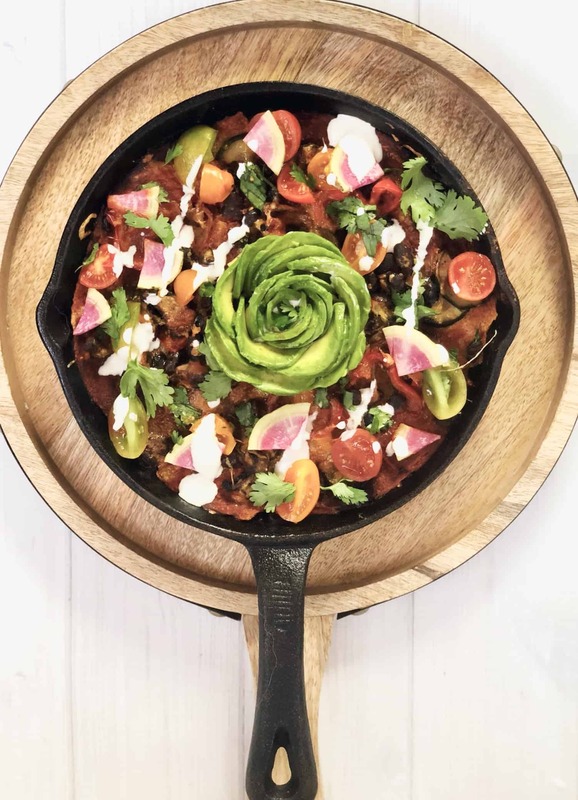 Looking for more delicious Mexican recipes?! Check out the Turkey Enchiladas here, or the 5 Minute Black Bean Tacos here! Now tell me, what’s your favorite recipe passed down to you from your mama?! This recipe looks sooo delish! I love all the fresh flavors in it. Can’t wait to try. This looks absolutely delicious! I love anything enchilada-inspired. And totally digging that avocado rose. Emily knocked it out of the park for sure!! OH MA GAD I AM SO MAKING THIS! looks soooooo easy and so yum! Will sub for plant based cheese tho. but thank you for the recipe! Our pleasure!! Hope you enjoy it! This is gorgeous, what a fun guest post! Congratulations on passing your RD exam Emily! Totally pinning this! Seems super simple and I can swap in the new so delicious shredded cheddar! Yay! 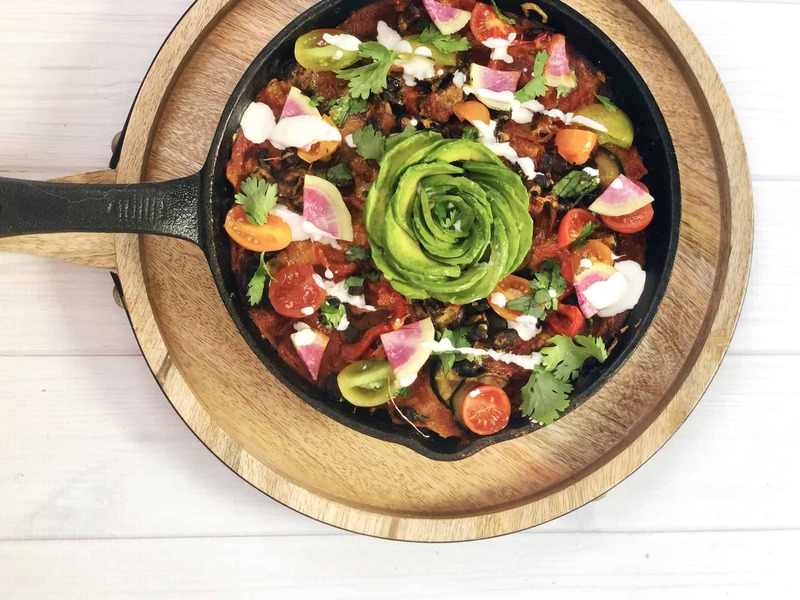 This doesn’t even look like a enchilada casserole, it looks like a vegetable dream plate! It tasted amazing but I didn’t even want to eat it because it was so beautiful! This was so easy and yummy! Love making avocado roses too! This is beautiful and totally hit the spot! I LOVE enchiladas. Def going to make this version! Ooooh you’re poor sweet mama! ? enchiladas can take a lot so this was so easy and so good!!! Haha, its okay, she has a daughter that can cook for her now! My only regret is that I can’t make an avocado rose as pretty as yours! New favorite weeknight meal! I am so glad to hear you love it! It is definitely a staple at our house too!